Born at Rosscarberry, Ireland on 8 February 1886, her family emigrated to Canada in September 1898 and settled at Beresford, Manitoba. In 1908, she was admitted to the nursing program at Brandon General Hospital and graduated as gold medalist three years later. She did her postgraduate work at Chicago, Illinois before becoming the Assistant Matron of Brandon General Hospital. She worked there until she was posted overseas in 1914 to work as a nurse during the First World War. She worked in field hospitals in France, and war hospitals in England. She was Matron of No. 1 Canadian Casualty Clearing Station. She was awarded the Royal Red Cross, Second and First Class, the latter being awarded to her by the Prince of Wales in 1919. 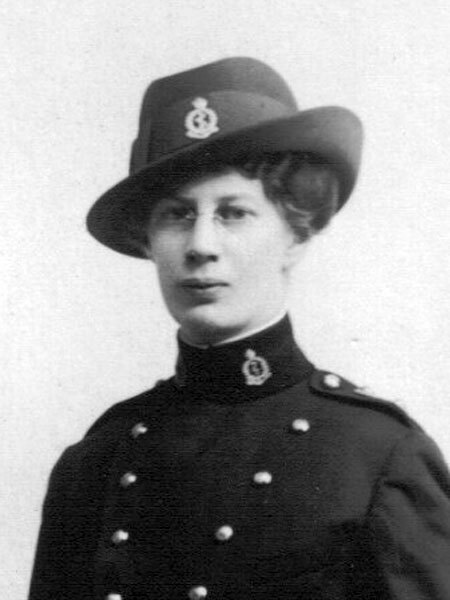 On her return from service overseas in 1919, she became the Fourth Superintendent of Nurses at Brandon Hospital. While Superintendent she worked to improve the working conditions of nurses and to establish standardized training programs. In 1920 she married Robert Darrach, and together they created a fresh-air camp for disadvantaged kids at Lake Clementi, south of Brandon. The camp lasted for over ten years. In 1934, in recognition of her exemplary community service, she was named a member of the Order of the British Empire. In 1936 she became the Dean of Women at Brandon College where she remained until 1953. She received the Centennial Medal in 1967 and Brandon University conferred upon her an honorary Doctor of Laws degree in 1971. She died at Brandon on 24 September 1974 and was buried in the medical section of Brookside Cemetery in Winnipeg. She is comemorated by Darrach Hall at Brandon University and Darrach Avenue in Brandon. “Mrs Darrach received 1st Award,” Brandon College Alumni News, March 1967. “Mrs. Darrach, She left her mark wherever she worked,” Brandon Sun, 26 September 1974, page 1. “Sarah Darrach honoured,” Brandon Sun, 8 October 1974, page 2. “Mrs. Darrach ‘she left her mark,’” Alumni News, January 1976. Brandon College Fonds, RG 1, Series 9 description, S. J. McKee Archives. We thank Maureen Johnson for providing additional information used here. This profile was prepared by Angela Graham and Gordon Goldsborough.